Short for 'Stand-to-Arms', the process of Stand-To was observed morning and evening by both sides of the war in the trenches, most notably on the Western Front. 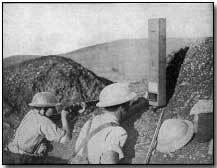 Each man would be expected to stand on the trench fire step, rifle loaded, bayonet fixed. The theory ran that most enemy attacks were mounted either before dawn or shortly after dusk under cover of darkness. Consequently both sides took care to ensure adequate preparation at such times, manning the fire step an hour before dawn and dusk. There was an obvious irony in that both sides took such elaborate precautions against the eventuality of an attack despite the fact that each would be engaged in Stand-To at exactly the same time. Nevertheless attacks were indeed launched at either dawn or dusk, particularly once it became clear to one side that the trench opposite was manned by relatively inexperienced troops. Stand-To lasted between half an hour and an hour, after which each man would be ordered to stand down; breakfast would follow in the morning. Stand-To came to be referred to as "the morning hate", for self-evident reasons.